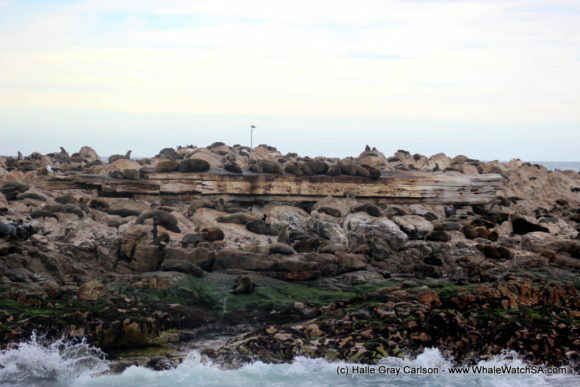 We departed today from Gansbaai Harbour again today due to the low tide (which was too low for departure from Kleinbaai Harbour) and made our way around Danger Point. On our way we passed by some whales however we knew we had some individuals on the other side of the headland, nearer Dyer Island, so we carried on our journey to find them. 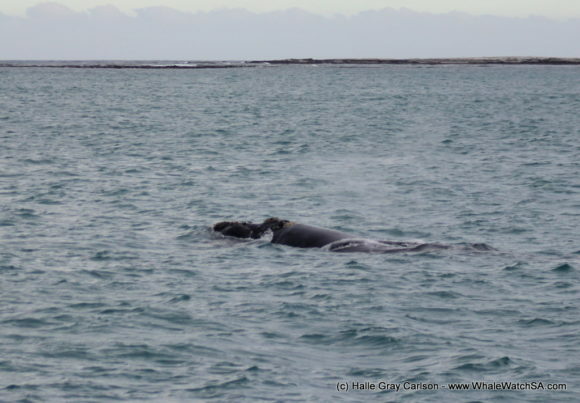 First we approached Kleinbaai Harbour, where two Southern Right Whales were frolicking. We got to see some interesting behaviours, in particular one whale turned over onto its back, showing us its belly and both pectoral fins. 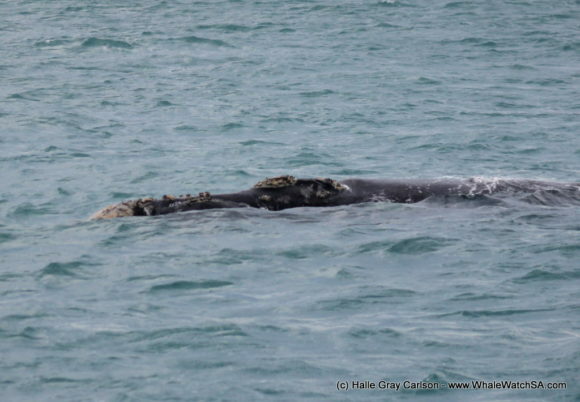 A Southern Right Whale can grow up to 40-60 tonnes with a single pectoral fin weighing around 2 tonnes. Though despite their enormous size, this species eats incredibly small food in the form of copepods (tiny crustaceans that drift in the sea water). They filter these out of the water using baleen plates which hang down from their top jaw. These plates have a fringe of hairs running down one side which is used like a sieve to hold in all the copepods when water is pushed out of their mouths. After watching this pair for a while, we continued on towards our cage diving vessel. On the way there, the view was beautiful with the sun shining through parts of the clouds creating a mix of yellows, greys, blues and even some purples in the sky. Unfortunately shark activity was a bit slow today so we moved on to Dyer Island. 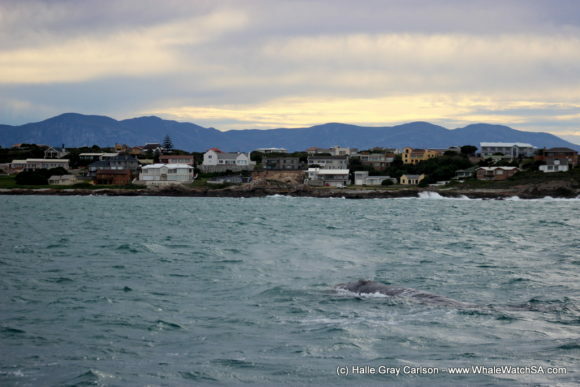 On the way there we had another sighting of a Southern Right Whale. This one was very relaxed, even surfacing right next to the boat! Our final sighting was two of the Marine Big 5 in one! 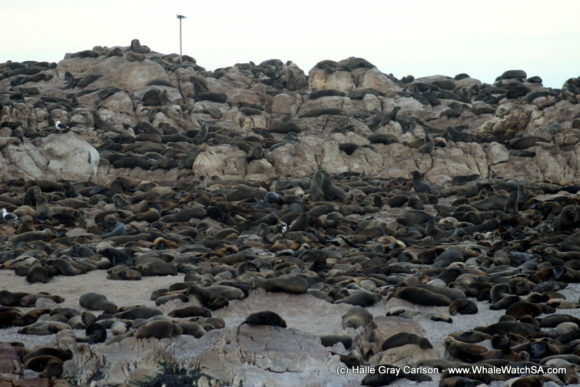 While in Shark Alley, looking at the Cape Fur Seals lazing around on Geyser Rock, one of our crew members spotted an African Penguin sitting amongst the seals. This is incredibly unusual as the seals can occasionally predate on the penguins, so this individual was being very brave! Our trip was completed by a ride out to deeper waters around the back of the island and then back to Kleinbaai Harbour so we could return to the Great White House for some soup and bread to warm everyone up!